Italian Panini is an easy, gourmet grilled cheese sandwich full of delicious ingredients! It's packed with prosciutto, mozzarella, marinated artichokes, and arugula. Serve this Italian Panini with marinara for dipping and it's the perfect quick dinner. This fantastic recipe came from my friend, Michelle, the blogger behind A Dish of Daily Life. Michelle specializes in fabulous—but easy-to-make!—healthy recipes, helpful how-to’s, travel adventures, and glimpses of her family’s daily life. She is a busy wife and mom, as well as an avid runner and sports fan. Michelle recently had to undergo a major surgery, and she will be recuperating for a while. For a blogger who blogs as a source of income for her family, time off from work means loss of traffic (and income). So, a bunch of her blogger friends decided that we wanted to help her keep up her traffic while getting the rest she needs. 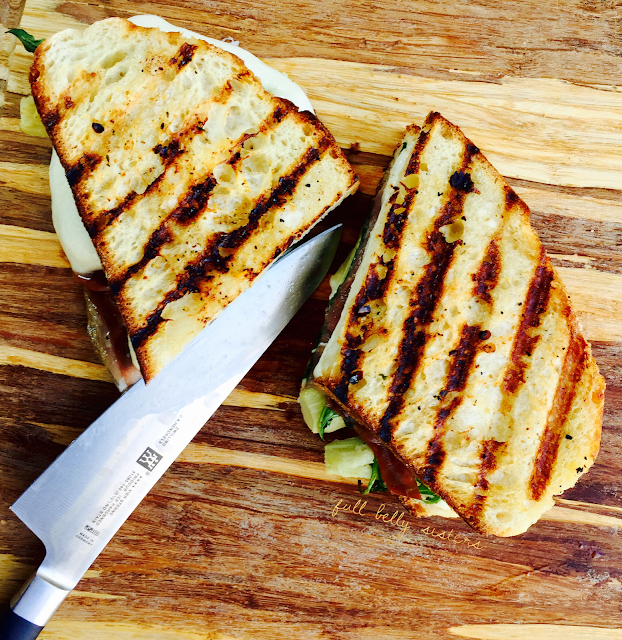 We would love for our readers to head over to Michelle's blog and check out all her delicious recipes—like this Italian Panini! I adapted Michelle's recipe ever so slightly, just to suit my personal tastes. In my version, I used a little less prosciutto and I added some drained, marinated artichoke hearts. Whether you follow my recipe or the original, I'm sure you will dig this fabulous sandwich. Combine herbs with olive oil. Brush outside of bread slices with olive oil mixture. Place three slices of mozzarella on one of the bread slices. Top with prosciutto, arugula, and marinated artichokes. Top with two more slices of mozzarella, then top with second slice of bread. Cook on panini maker until bread turns golden and cheese melts. If you're like me and don't have a panini maker, just use a stove-top grill pan and press it down with a heavy pan while it's cooking. Warm the sauce while the sandwich cooks. Serve the sandwich immediately after cooking, with warm marinara on the side for dipping. This was a big, rich, satisfying sandwich! I actually ate one half, then saved the second half to warm up and eat the next day. It's super delicious and very filling! This post contains affiliate links, so I make a small commission if you purchase through my links—which helps to keep this blog running.Thanks for your support! I love sandwiches. I could eat them every day. This one is definitely going into the rotation! Yum! I love everything about this AND I have all the ingredients already in my house. This is happening tomorrow at lunch! Oh heavens this looks amazing! I wish that I had a panini press but for now I use my old George Foreman grill or my trusty cast iron skillet. This is first on my list! What a great Italian Sammie! I love the addition of herbs to the olive oil as well. This sounds great, and I'm a big sandwich lover! This panini looks delicious! I love a good sandwich and this one is toasted to perfection and stuffed with everything I love!